Education and Technical Assistance: We provide education and technical assistance in nonprofit best practices, mortgage services, fundraising, construction, and regulatory compliance to local affiliates. Resource Development: We develop partnerships that bring funding, people, supplies, and technology to local affiliates, which broadens our impact on the housing needs of Texans. Disaster Services: We prepare Texas affiliates and communities for disasters and coordinate for long term recovery after disaster strikes. Advocacy: We raise awareness on housing issues by serving as a liaison, thought-leader, and policy advisors to lawmakers, elected officials, and state agencies. Habitat families achieve long-term financial security and self-reliance through paying mortgages, paying taxes, and investing in their communities. They work to build their own homes, called “sweat equity”, and give back by working on the homes of other partner families. Economic impact analysis shows that property values in Habitat neighborhoods rise, crime is reduced, and quality of life for the entire community is improved. Simple and decent While all Habitat homes share similar design features, the differences in climate and construction techniques ensure ample individuality. Additionally, homeowners are given opportunities to customize their homes. Sustainable construction practices We build sustainable homes to take better care of our environment, our homeowners, and our volunteers. Our goals are to reduce the home’s monthly and life cycle costs and increase efficiency and durability while providing healthy environments. Accessibility Throughout North America, Habitat affiliates are encouraged to build with special attention to wheelchair accessibility for both homeowners and visitors. Habitat affiliates provide new home construction for partner families, following the fair housing and housing accessibility guidelines. Some may also have a ReStore, provide critical home repairs, engage in Veteran Build, Women Build, and Neighborhood Revitalization. Find your local affiliate to see the programs, services, and volunteer opportunities (it’s not just building) available in your community! By the numbers . . .
Habitat’s ministry is based on the conviction that to follow the teachings of Jesus Christ, we must love and care for one another. Our love must not be words only – it must be true love, which shows itself in action. 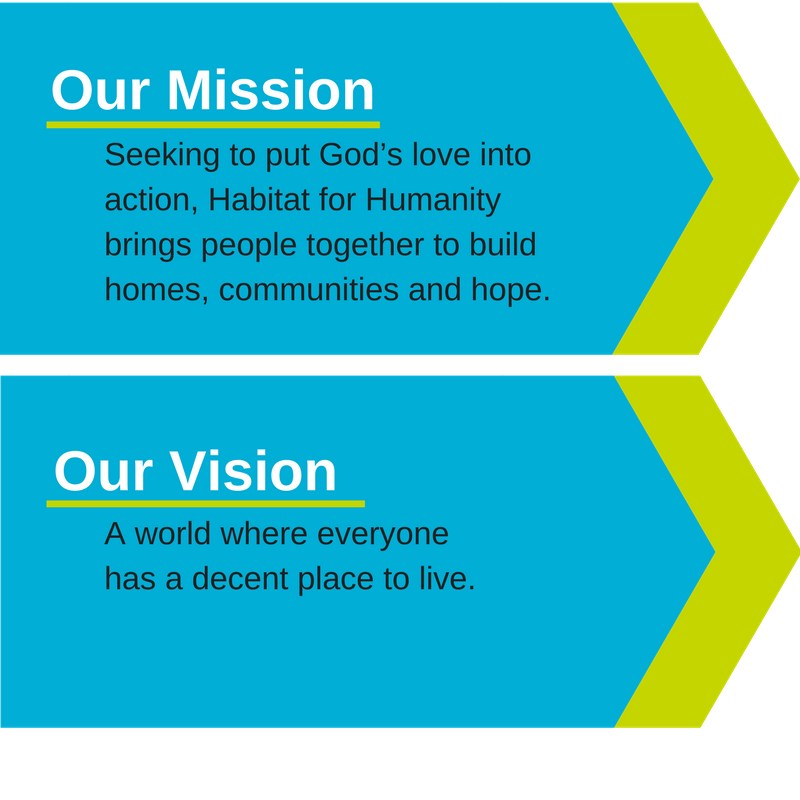 Habitat provides an opportunity for people to put their faith and love into action. We bring diverse groups of people together to make affordable housing and better communities a reality for everyone. Habitat for Humanity has an open-door policy: All who believe that everyone needs a decent, affordable place to live are welcome to help with the work, regardless of race, religion, age, gender, political views or any of the other distinctions that too often divide people. In short, Habitat welcomes volunteers and supporters from all backgrounds and also serves people in need of decent housing regardless of race or religion. As a matter of policy, Habitat for Humanity International and its affiliated organizations do not proselytize. This means that Habitat will not offer assistance on the expressed or implied condition that people must either adhere to or convert to a particular faith, or listen and respond to messaging designed to induce conversion to a particular faith.